Looking for a general office security guide? Scroll down for an overview of office security. Looking for more? Visit our overview of how access control is installed. Providing workplace security where all employees feel welcomed, yet allowing for the company to be rest assured that security is guaranteed, is a difficult balance. 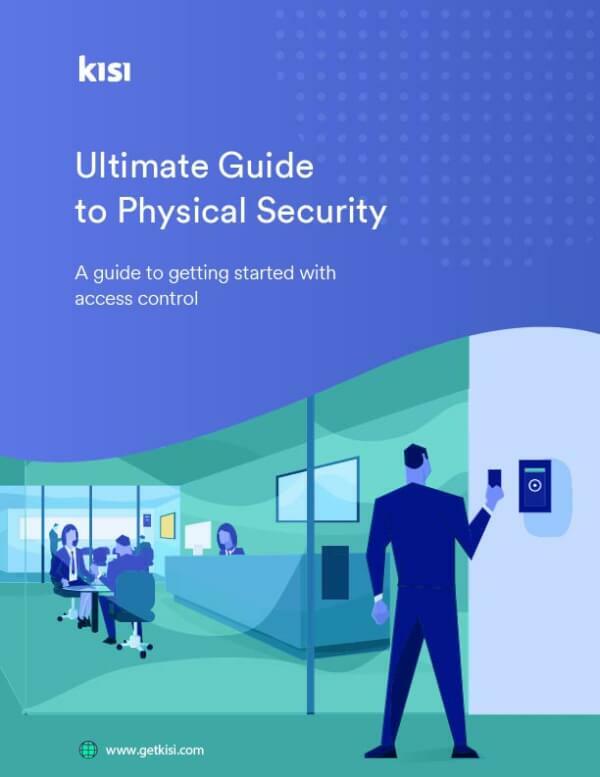 Access Control Guide: for those who are just getting started reading about access control systems. How It Works: ready to jump into specific use-cases for access control and understand the tech. What Is Access Control: read why access control is a great methodology to keep security organized. Click on a category to read more about specific office security guides.Scroll below to read a more general guide to office security. Office security systems are essential for many different type of businesses, regardless of the industry. You might initially think of door locks or surveillance cameras, but beneath these are about your employees being able to feel safe and secure at the workplace so they can stay productive. Coupled with your protected facilities, your business will be able to grow effortlessly. Most people agree that a secure work environment is needed, but choosing the right office security systemamong the many different options can be confusing. At Kisi we have helped thousands of different sizes of companies design, specify and implement the right security system that fits their office and budget. Finding installation partners including locksmiths, resellers or integrators to install new access control; training companies on the system is part of our services as well. Based on our experiences, we created this guide to make it easier getting a headstart in understanding security needs, thus deciding which system to choose to provide a secure workplace for your team. Why think about office security? Here's why it’s important to protect your staff, assets and business operation. Very often, workplace managers don’t take office security seriously until an incident like break-in or theft happens. By then, it’s already too late with physical and data losses, interruptions to workflow, and concerned employees. According to Verizon’s Security Report, 22% of cyber hacks involve abuse of physical access. On average these break-ins costs $38,000 for small businesses up to $551,000 for larger businesses and often severe dents a business' reputation and operations. Creating a plan for office security can help prevent these situations and incidents to keep your office not only secure but a productive and happy place to work. Having a secure office makes your team feel trusted, comfortable and efficient. It provides peace of mind for your entire company to make it a great place to work at. Typically in office security, there are three important areas when coming up with a strategy to protect your office -- your employees, assets and business operations. Creating a secure, transparent and supporting culture. Keeping the workplace safe from unauthorized access including disgruntled coworkers and customers. Securing office equipment including laptops, hard drives and other electronics. Keeping employees' properties safe including wallets, phones, tablets, and personal laptops. Interruption of business including lockouts, missing tools. Liabilities including insurance, IP protection and lawsuits. Since the main goal of a secure office is to provide an environment for your employees to be productive and your business to grow in, people need to be able to stay secure, focused and efficient. Building security: Does the building have access control including ground floor access, video surveillance or lobby security in place? Office hours policies: When should the doors be open or accessible by staff or visitors? What happens during holidays or weekends? Access policies: Can employees and guests enter your building or facility when the office is closed? Visitor policies: Are guests allowed in your building and office and what procedure needs to be run through so they are permitted to enter? Visitor compliance: Is an NDA required when a guest enters your space? Office hours: When should the office be accessible? When will the doors be unlocked or locked? Workplace policies around front desk and reception: What are the processes for visitors or guests and front desk staff? Secure access: Who and under which conditions has access to sensitive areas including IT rooms or communications closets or executive offices? Employee behavior at work: What do you expect from employees at work in regards to security? Many of these might seem obvious but if you are able to set those policies with everyone on board you’ve done a big step towards a secure office and it will help you make decisions around workplace security that will be a better fit for your company. Ethical principles and values that inform your business decisions. Expectations for employee behavior including communication and actions. Commitment that everyone will be held accountable to the code of conduct. Point of contact for questions, e.g. an HR or people operations or culture team member for questions or reporting violations. As soon as someone new is hired, the security onboarding begins: You need to make sure they are informed about the security behavior guidelines, understand them and agree with them to act to their compliance. They need to know exactly what is permitted and what not - including signing an expected visitor in and out, the opening hours, and when the office can be accessed and when not. A receptionist or front desk representative can be key to creating a secure culture among employees, help orient visitors and create a welcoming experience for everyone. They are also a gatekeeper to enforce policies at the door including making sure NDAs are signed. To ensure data security in your organization, you need to go beyond securing the office and make sure employees use encrypted hard drives, leverage Two Factor Authentication on their devices and log-ins and don’t leave their devices in open areas or even unlocked at their desk. When designing the a robust security system, you will need to consider access control, surveillance and alarms. 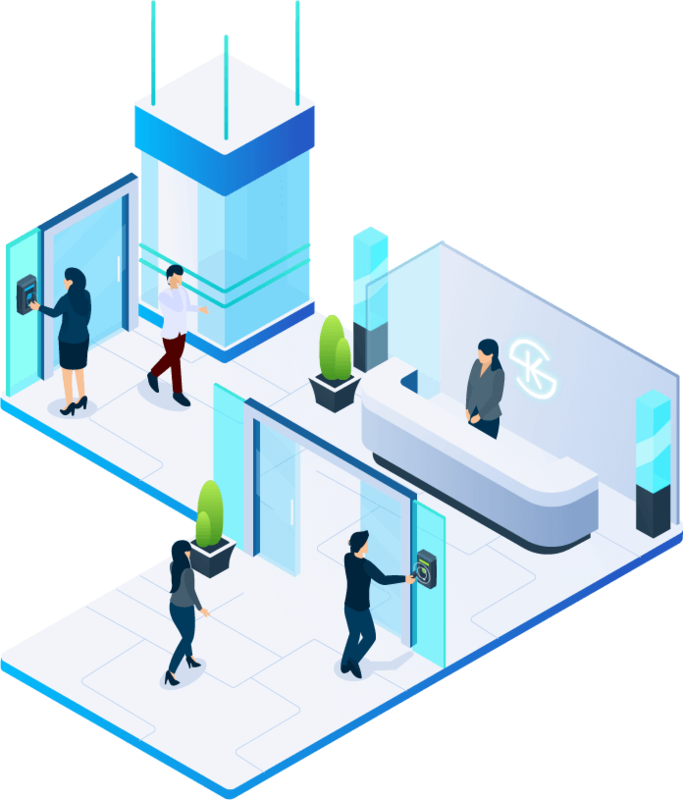 We’ve written about access control in our “Introduction to Access Control” -- access control is the system that allows you to manage who is permitted to access your space. By setting permissions and rules around access control you can define which time periods are allowed for access and the levels of access someone needs to have to access a certain door. It also keeps track of who accesses the space, producing event logs which help with compliance. The most traditional form is having locks and keys, but keys can easily be copied or lost. There is also no events log that you could check to see what happens. A slightly better option would be an electronic access control systems which send a signal to an electronically wired lock to unlock the door. To unlock the door you either use a keycard, fob, keypad with code. However, you will still be unable to specifically track down who has access to your doors as these keycards or fobs can be easily passed around. You will also be unable to remove access from specific people. The best type of access control is in the form of a mobile app. Its benefits are multifold -- simple yet comprehensive management of access, remote access control management, real-time events log. A comprehensive and robust access control keeps your staff and company assets out of reach from unauthorized guests, and allows you be aware of who is in your offices in event of theft or emergency. In addition to access control, you will need video surveillance simply because access control only tracks unlock events and does not provide a visual proof of that entry or exit. Surveillance cameras are connected to internet to record visual activity around entry and exit points of your office or critical high traffic areas such as the front desk or package room. Streaming of live footage: You might want to remotely look at a real time video stream to see what is going on in the office. Storage of video recording: Typically companies need a 30 day video storage so they can go back in time in the event they discover an incident. The differences would be cloud or local stored which comes at a price vs convenience decision. Access control and intercom integration to be able to hear the doorbell ring, check who is there and unlock the door - all done remotely. Advanced solutions also provide alerts based on motion tracking or face recognition which might add another layer of security. Since your co-workers and employees know that the space is being monitored so they can be rest assured that should something should happen, there is visual documentation. Protect against theft: If a random burglar or even an employee takes valuables you now have video proof. Keep your business running: Know who was in and out at what time for a peace of mind. Video surveillance systems are crucial for growing workplaces and offices where not everyone is known to all employees. Typically you should install one camera for each door and then one or two on top of that for high-transit areas. The third aspect of office security are alarms and alerts. Alerts can help notify you to suspicious changes in your environment such as someone breaking in or opening a door during off-hours. Some companies also use temperature or humidity alerts to protect valuable electronics.Of course alarms are most efficient when integrated with video and access control. An access control system allows to control who is coming in and the alarm system notifies you when something is off. You can then use cameras to see what is going on in the space to confirm any activity. Look for integration with security cameras or access control systems - they sometimes already include some of the alarm features. Ability to arm or disarm the alarm remotely. You might want a third party company to monitor your alarms but typically it is more helpful if alarms go to you since they will just call you or the police anyways. Integration of other sensors into the alarm ecosystem like heat or humidity. Alarm systems are a great enhancement of the other two components of office security which are access control and video surveillance. They allow to monitor your office space to know if an incident might be about to happen and be able to step in before damage occurs. Companies who have expensive inventory or sensitive data in their facilities such as medical or financial companies need alarm systems and are sometimes legally required or asked by the insurance to install it. 1 door with around 10 employees: Getting started with access control and a basic video camera is a good start. 4 doors with larger headquarters: You want a potentially scalable access control system that has a similar level of security as your other systems. 12 doors across multiple floors and a few satellite offices: This means you might have a small IT team already so you can invest in something that streamlines your workflows, integrates with your tools and hardens the security of your company to make it ready for growth. If you are a company with 50+ doors at one location you have special needs for access control for compliance, security or other reasons that significantly impact your business. You should look for a security system that enables your business and allows you to maximize utilization of space. Number of doors, number of employees and number of locations of your space. Type of inventory, equipment or other physical assets in your office such as computers, merchandise or other IT equipment. Compliance requirements including physical security, e.g. PCI, HIPAA or SOC2 compliance. Sensitive information including health, financial or IP data. Depending on the location you might be more prone to theft and intrusion. Activities in your space like social events might increase the need for office security. Consumer grade hardware often draws power through wall adapters which easily can be unplugged. Commercial grade security hardware is often hardwired, mostly even draws their power via the ethernet cable (PoE) and uses a backup battery to prevent eventual power outage. Consumer devices are often connected to your wireless internet (WiFi) which especially in case of video can slow down your connection speed. Consumer security devices often are not integratable with the rest of your IT infrastructure and tools. 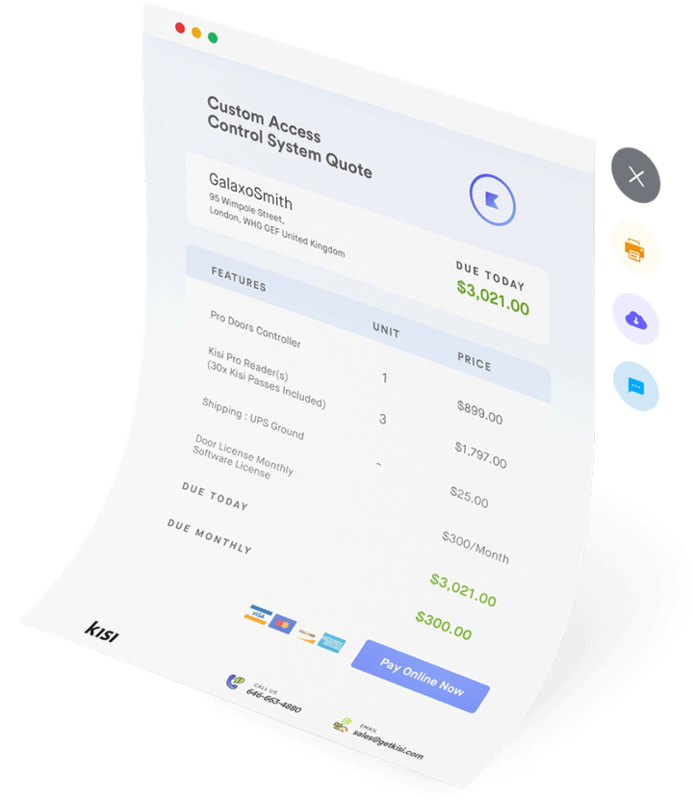 Commercial grade hardware and software allows for example for API integrations or even comes at more advanced integration offerings such as Two Factor Authentication or Single Sign On. Consumer devices typically offer a consumer service hotline. Commercial security systems also provide services around installation, ongoing support and emergency repair. With consumer devices you might be bound to a simplified data set that is “good enough” for the average consumer. With enterprise office security you get more granular and accurate data that allows exporting, filtering and automated reporting. Security in consumer hardware is often in the news because its lack of hardened processes. Commercial grade hardware runs fine behind a firewall and has documented security from software to cloud to hardware. More so commercial providers typically work with your custom security requirements including penetration tests. Typically your construction company or IT vendors can already run needed cables. Running cables in pipes to comply with your installation standards. You might be able to re-utilize existing wiring, cameras and locks - just ask your security vendor. Typically there is volume-based pricing if you buy more hardware. If you need a Certificate of Insurance (COI) that drives up the price. Especially in San Francisco or Los Angeles you also might have to use a unionized installer for certain parts of the access control which is a much higher expense than non-unionized labor. After installing the hardware, it needs to be connected to the internet and be tested which will add additional set up cost. Setting up the software system for monitoring or management needs additional hours which you should factor in your budget as well. Integration in to your other systems are potentially expensive if it has to be a custom API integrationand you don’t have the resource in-house. Training and on-boarding employees on the system. Training and updating administrators to monitor, manage, troubleshoot and configure the system. Integration in to your other systems are potentially expensive if it has to be a custom API integration and you don’t have the resource in-house. Unfortunately, businesses typically look at security at the very last minute as getting a new space is extremely time consuming. However, planning, configuring, installing and testing security systems typically take a few weeks up to several months. The sooner you can start planning your workplace security, the better and smoother the roll-out to your organization will be. Since security systems often require pulling cables and drilling in walls, you want to factor that in during renovation or construction phase. At Kisi we have worked with thousands of companies to evaluate their security and connect them with trained and licensed installers and integrators to get their office security setup and keep their business running smoothly with an effortless security culture and a productive work environment.